Will you be surprised if I tell you that this is the most indelible image from this episode for me? I cry when I see it. Episode 18 is all about resolve and remembrance and this image encapsulates everything that is meaningful about the episode. Hwan’s left hand steadying his right. Hwan finding strength from within himself. The image is from one of two scenes that I love the most in this episode and possibly even in the whole drama so far. Two scenes that break my heart. Let me begin with the first one. It’s just another day in the second branch. The staff are absorbed in their tasks: taking orders, replenishing water and kimchi, clearing the tables. A young girl tells Hwan that she enjoyed the food. He laughingly tells her not to call him “Ajusshi” but “Oppa.” Their banter is witnessed by Eun-sung and she smiles at the sight. Just as Hwan is walking away, a male customer at the table in front turns and crosses his leg. 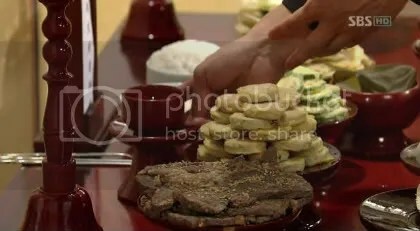 It’s too late for Hwan to see the outstretched leg and he trips and falls to the ground, dropping his tray and the bowls and plates on it. Remnants of soup and kimchi splatter everywhere. The customer, who had earlier grumbled about being brought to the restaurant by his friend (apparently the smell of the beef soup is too pungent for him), looks at the stains on his pants and scolds Hwan: “Don’t you have eyes?” But his friend tells him it’s his fault for tripping the waiter; moreover, there are more splatters on the waiter’s clothes. Eun-sung sees what is happening and is about to march over, but the manager stops her. The two stand and look from a distance, waiting to see how Hwan will handle the situation. “Take it,” the man continues tauntingly. It’s clear from Hwan’s face, as he picks himself up from the floor, that he is angry. He clenches his fist, the same way he clenched it right before he punched Jun-se in Episode 16, and bites his lower lip. In what seems like minutes but is really just mere seconds, he fights to compose himself. The struggle is both internal and visible: his eyes seem to fill with tears at the effort. It was the long pause and the quiet “Sir” that did it to me. I cried. What a test and what an outcome. If there are any doubts that Hwan is a changed man, this incident dispels them all. A demeaning and potentially explosive situation handled with dignity and humility, with his rage firmly under control. I thought my heart would burst with pride. Months from now, if you ask me at what point I can say with certainty that I love Lee Seung-gi’s Hwan in Brilliant Legacy, I will tell you that it is the moment he reined in his anger before a man who had treated him with condescension. This very moment. Hwan’s meekness before the customer is all the more laudable when we see how angry he really is. He goes up to the rooftop and lets it all out, grimacing and cursing silently, unaware that Eun-sung is behind him. He turns and sees her with a washcloth in her hand. I’m sure the scene that follows is a favorite with many people who are eager to see any little progression in Hwan and Eun-sung’s relationship. To them this scene is perhaps second in this episode only to a certain road scene (which I have lots to say about). But I didn’t find the scene particularly romantic, just amusing. Eun-sung takes the washcloth and wipes the stains from Hwan’s top. Her gesture startles him and he takes the cloth away from her rather roughly. As he’s cleaning the kimchi stains from his clothes, Eun-sung launches into a tirade against the customer who had tripped Hwan. As she flails her arms and rattles on nonstop, getting angrier by the second, she does not realize how comical she looks. Her overreaction is just typical of her erratic behavior around Hwan lately. Fortunately for Eun-sung, Hwan is pretty dense when it comes to anything related to her, so he doesn’t see it as the behavior of a girl who’s trying to camouflage her feelings. Instead he thinks she’s indirectly chiding him because he used to behave exactly like the customer. Didn’t he cause Eun-sung to trip and fall at the nightclub when she was working as a waiter there and didn’t he behave like a complete jerk with her? Eun-sung defends herself and says she isn’t the petty sort to rehash old grudges. Then why are you so angry, he asks. You have no reason to side with me. The two mull over the unspoken implications of his words (and her weird behavior). Shouldn’t she be delirious with joy that he’s being served a lesson? Instead she’s behaving all aggrieved on his behalf. As if she’s his mom or sister or… girlfriend. Our embarrassed girl blurts out “Because we’re partners!” and is thankfully rescued by a summon to go downstairs. The manager wants to speak to them. Just as Hwan’s response to the odious customer made me cry, it apparently also moved the manager and he conducts a graduation of sorts in his office. Our sweet manager (love him!) unpins the scowly-face lapel button from Hwan’s uniform and pins the smiley-face version in its place. No longer is Hwan an oddity, a part-timer working full-time, wearing a lapel button that sets him apart from the rest, like a badge of dishonor. He is now officially a valued member of staff. Yes! Everyone cheers as Hwan thanks the manager shyly. He touches his new button in wonder, amazed that a little thing like that can make him and the others so happy. Hwan and Eun-sung return home from work and she sees the family busy in the kitchen. What day is it today, she asks Hwan’s mom, but the latter ignores her and talks to Hwan instead: You do remember that today is your dad’s memorial day, don’t you? Yes, Hwan remembers. He had marked the date on his calendar. Earlier in the morning, as Grandma and Hwan’s mom discussed the memorial preparations, they had talked about how this would be Hwan’s first attendance at his dad’s memorial. The last few years he had been studying abroad and did not return to commemorate the day. Upstairs in his room, Hwan changes into his black mourning clothes. His hands tremble as he buttons his suit. The memorial ceremony gets underway. As his father’s only son, Hwan comes forward to pay his respects, his face drawn. 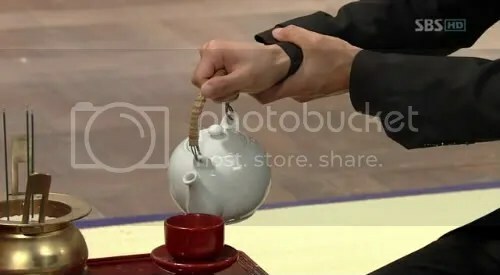 As he attempts to pour the tea, his right hand holding the teapot begins to shake. The trembling is visible only to Eun-sung who is standing at a distance. The other members of the family are behind him. She looks at him and remembers what Jun-se had told her about the accident, about how it had affected Hwan and how he had erased it from his mind. As his right hand continues to shake, Hwan uses his left hand to clasp the right wrist tightly. He pours the tea into the cup and brings it in front of the ancestral tablet. His left hand is still on his right wrist, still clasping and calming it. For the second time in this episode, my heart feels like bursting. How I wish I can reach inside the screen and give him a hug. After the ceremony, the family gathers in the living room to talk about the dad’s passing. Just as she did during the memorial ceremony, Eun-sung stands a distance away. As they talk, Hwan’s mom wonders aloud about the hit-and-run accident. Why did the dad come out of the car, leaving Hwan alone inside? What vehicle hit him? What exactly happened that night? Before I die and while I still have my wits around me, I want to know how your father died. You must try and remember. Hearing his grandmother’s words, Hwan nods, as if saying, Yes, I will try to remember. His eyes are wet. That night, in the darkness of her room, Grandma clasps her son’s photo to her bosom and sobs. Outside, a man sits on the garden bench and cries like we have never seen him cry before. In the distance a girl watches. The next day Hwan and Eun-sung come down dressed in the same colors (mere coincidence? ), ready to meet with their first corporate client. Grandma passes the car keys to Eun-sung and insists she takes the car. At the second branch, everyone is excited as Hwan and Eun-sung collect the food samples and set off for the Shin In Dong factory. Hwan reminds Eun-sung teasingly that he’s the one who initiated contact with the company. The food testing goes well and a catering contract is signed between Jin Sung Food and Shin In Dong. Our triumphant pair can’t stop smiling (1520 bowls a week from this contract alone!) and Hwan tells Eun-sung for the nth time: It was all my idea. But just as they are about to leave, the president of the company arrives. 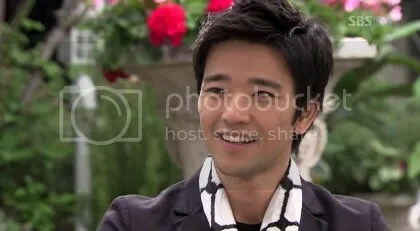 To their chagrin, they find out that he is Jun-se’s friend and that Jun-se is the one who told him about Jin Sung Food doing corporate deliveries. As expected, Hwan is livid. Accusing Eun-sung of colluding with Jun-se, he refuses to listen to her explanation that Jun-se must have merely made the introductions and it was still the proposal sent in by Hwan that sealed the deal. You sure approve of Jun-se. Is he that great? Cancel the contract! Why must it be Jun-se? You’re accepting his help so that you can achieve the sales target, isn’t it? Why must you go to that extent to get Grandma’s inheritance? If you covet it so much, at least use legitimate means! Stung by his words, Eun-sung pulls the car over abruptly and storms out. Unprepared for what she just did, Hwan hurriedly gets into the driver’s seat and drives alongside her, yelling at her to get back in. She ignores him and turns and crosses the road instead. Stopping the car, he yells: Where are you going? Get back in, it’s dangerous! I want to use legitimate means, too, and I didn’t ask for Jun-se’s help. Am I someone who is so thick-skinned? I’ve always felt sorry toward you! Just as she finishes her words, a truck tears down the road. Eun-sung freezes. In that very moment, Hwan suddenly recalls how his father’s accident happened. 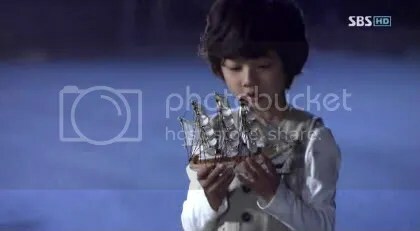 On that night so long ago, as his dad was driving, little Hwan dropped his toy boat out of the car. He got out to retrieve it (quite unthinkable that his dad would let him do something so unsafe), but a truck was coming down the road. His dad ran out to save him but got hit instead. That was how the father lost his life. All the while that Hwan is having his flashback, I’m thinking: Hurry and finish it! Eun-sung is going to be roadkill by the time you’re done! Are you crazy? What are you doing? Why are you doing this in front of me? Do you really want to see me go insane? I’m sure that this scene, henceforth called The Hug, is the highlight of Episode 18 for many, many people. After all, it’s already eighteen episodes and we are way overdue for some loving bodily contact. His one-of-a-kind hand-holding doesn’t count; let’s dismiss Episode 17’s Ride of Terror as well. This hug is the real thing, at last! But at the risk of being hit with a tray of rotten eggs, may I say that The Hug did nothing for me at all? I don’t mean to be flippant, but the image below reminded me of the dance elective I took one summer in college. I emerged from that course red-faced, acutely aware that I possessed the agility of a hippo on crack. Others could dance fluidly, but I was as stiff as a signpost. Could you get a more posed picture than that? I burst out laughing the instant I saw it. Look, it’s as if our couple are taking waltz lessons conducted in the middle of the road and all of a sudden their wacky coach yells, FREEZE! But the posing is just a teeny quibble. I don’t really mind it because it’s so Hwannish anyway and I’ve come to love all of Hwan’s little awkward quirks. What made me cringe was his overreaction after The Hug. He pulls away from her and then he goes ballistic. The overacting sticks out like a smoking chimney. He winces, he throws his head back, he shakes it, he sighs loudly, he shouts. His face looks like it’s going to crumble into tears, or explode, or both. What’s going on, Hwan? You were doing awesome thus far in this episode. Your restrained and powerful acting in my two favorite scenes moved me to tears. Then suddenly, this? You need to stop because you are scaring Eun-sung. Did you see the blood drain from her face? The poor thing is about to faint because of you. Hwan’s coiled scarf never becomes uncoiled in the commotion. No wonder he doesn’t let it hang loose like how most people would wear it. There was a reason after all! A traumatized Eun-sung realizes Hwan is connecting her near-miss to his dad’s fatal accident. I’m sorry, she says, but he walks away without answering. He stands by the roadside, maybe to let his anger subside, and she reaches out to touch his back but stops herself. They drive back in silence and arrive at the second branch glum-faced, a total change from how they left that morning. The manager, ever so sharp-eyed, stares at them befuddled. After they return to their office, Hwan leaves in a huff. Eun-sung herself goes off to find the one who had caused Hwan to blow his top in the first place. Let me pause here because I need to gasp… twice. I don’t need to explain the first gasp; I already did in my last recap. The second gasp is because of what he has around his neck. Jun-se, listen. I understand you’ve been feeling threatened by Hwan lately and you think of him as a serious competitor. But you don’t have to emulate his dressing. You have your eyes. What other adornment do you need? Remember what you wore earlier in the week when your dad came to meet you and issued you with an ultimatum? Stop seeing Eun-sung or you’re not my son anymore! Your eyes were like daggers when you heard your father’s words, but not for a moment did that affect your dishiness. You didn’t need a scarf then and you don’t need one now! In-young, a mutual friend of Eun-sung and Seung-mi, arrives to meet Eun-sung for a meal together. 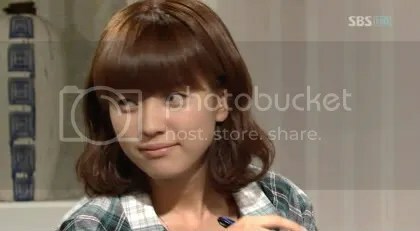 Jung is visibly irritated when she sees Eun-sung at Jun-se’s cafe, but she has to serve them because Hye-ri is not around. I’ll have the most expensive item on the menu, In-young says. It’s my chaebol heir friend’s treat. Her words infuriate Jung who thinks Eun-sung has been going around gloating about getting Grandma’s inheritance. Eun-sung apologizes and tells Jung they’ll order later. She then scolds In-young. But the latter in turn reprimands her for being greedy and stealing the inheritance from Jung and Hwan. How can you ruin someone’s family like that? Speaking of greed and theft, it’s time to talk about our resident witch. To do that, we need to return to the first scene in this episode. Remember how Episode 17 ended with Eun-sung’s dad chasing after her bus? Well, Episode 18 picks up from there and we see the poor man running in vain. The bus is just too fast for him. So he goes dejectedly to where his wife is waiting, inside her exy-looking car bought with money that belongs to Eun-sung and Eun-woo. He tells her he’s not going to leave Seoul now because he just saw Eun-sung on the bus. She’s not in America, she’s here! Good grief, your eyes must be playing tricks on you. How can a person in America be in Seoul at the same time? She’s not David Copperfield! Anyway, she’s such an ingrate of a daughter cutting off contact with you and all, so you best forget about her. To the orchard you shall go, hoho! He replies: No way, Jose, I’m staying put here until Eun-sung herself tells me to scram. Until such time I’m going to search every nook and cranny in Seoul. The witch promptly pulls her hair out. 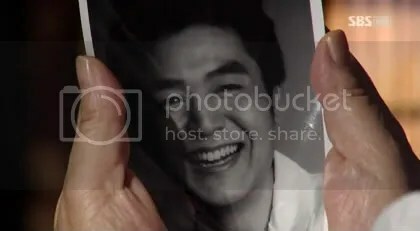 Returning home after her Mission To Ruralize Husband fails, the witch walks into Seung-mi’s bedroom and is shocked to see a photo of Eun-woo on her daughter’s computer screen. What are you doing, she screams, why is his photo there? Delete it at once! Stop wavering and come to your senses. Stop doing such worthless things! Why am I doing such worthless things? Because I want Eun-sung to think well of me. She’s a kind-hearted person. If I can find Eun-woo before Eun-sung finds out about Hwan’s feelings for her and before she herself develops feelings for Hwan, she wouldn’t take Hwan from me. Moon Chae-won’s acting is fantastic in this scene. She cries so naturally you can’t help feeling wretched with her (for about ten nanoseconds). Too bad about her parentage on the maternal side. Apparently witches lack a compassion chromosome (to compensate, they possess rub-it-in chromosomes in spades). Instead of consoling her distraught daughter, the mom makes her feel worse by blaming her. What have you been doing all these years that you haven’t been able to grab Hwan’s heart? Well, Mama Witch, it isn’t your daughter’s fault so stop the guilt trap. Seung-mi is competing with the cutest thing this side of kdramaland, so the outcome is a foregone conclusion. In fact, do you know that your prized Hwan is so smitten with this cutie he even tries to dress like her? You see, what happened was that Eun-sung wore that checkered top one night while having a work discussion with Hwan. All the while he looked like he was churning out ideas to drum up sales for the second branch, but the truth was he kept studying Eun-sung. So convincing was Hwan’s charade, his sister Jung even ran downstairs shrieking to her grandma and mom: Oppa is having a work meeting with Eun-sung! It was like the ultimate betrayal, y’know? Hobnobbing with the enemy, tsk tsk! What was Hwan thinking? But like I say, it was all a farce. All he was doing was studying her clothes (and her face). The very next day, lo and behold see what he wore! I rest my case. On the day of the memorial ceremony, while Butler Pyo and Hwan’s mom are in the kitchen, he unwittingly makes a confession of sorts to her. For the last thirteen years, he has observed that she will fall ill within the week after the memorial. It’s as predictable as seeds sprouting after the rain. Wow, whatever made you pay attention to something like that? she asks innocently. Just because, he replies, his tone clearly indicating End of Discussion. Like the good butler he is, he supervises her cleaning and washing. So out to the garden they go, to hang the just laundered sheets. Stop jumping about or you are going to fall, he warns. But she’s too giddy to listen to him. Today is Marketing Day, which means she gets to spend money. Yippee! True enough, she trips over the laundry stand. There to catch her as she falls is our butler. Another unplanned confession is coming up, this one from her son. After our dramatic The Hug scene, Hwan is moody (for a few reasons: Jun-se, Eun-sung, his dad, his own jaw-dropping outburst) and he leaves the second branch without saying where he is going. He receives a call from his friend Young-seok, the one harboring Eun-woo and using him as a cash cow. Come help me watch my nephew (ya right) for two hours because the inspection people are coming and I need to clean the bar. Ramyeon Hyung, says Eun-woo when he sees Hwan. (I like the nickname, don’t you? Hwan does cook decent noodles even if he doesn’t add anything nourishing to them, not even an egg.) Hey, Piano, slow down! shouts Hwan when the boy starts running, so excited to be out on the streets. As they are eating in a fast-food joint, Hwan starts to ruminate aloud. I have a friend who has a brother just like you, who also likes to play the piano. You only like the piano. Isn’t there a girl you like? Ah, I see. Well, that’s good to know. The piano’s not going to dislike you, right? Do you know the feeling of liking a person who dislikes you? Among the girls I know, there is someone called Spy. Little brat. You haven’t seen her, so how do you know she’s pretty? But you’re right, she’s as mysterious as a spy. The thing is, whenever I’m with her, I’ll forget these realities (that she’s mysterious; that I don’t know who she really is; that she complicates my life so much). Anyway, it feels good to say what has been in my heart. The feeling of liking a person who dislikes you. I wrote at the beginning of this recap that I have two favorite scenes from this episode. Make it three. I love how Hwan looks (his cute dimples when he smiles), I love how Eun-woo is paying attention even if he seems intent only on eating, I love how comfy the two are in each other’s presence. They are building a natural bond with each other — a bond that is going to be very important in the future. I can’t wait for the moment when Hwan realizes Eun-woo’s missing brother is Piano! As Hwan is talking boy-girl stuff with Eun-woo, Eun-sung is doing the same with Hye-ri, except Eun-sung isn’t relaxed like Hwan. Still upset by In-young’s accusation that she’s stealing the inheritance from its rightful heirs, Eun-sung wonders if she should give it up. Increasingly she is feeling sorry toward Hwan. He is trying so hard to change and he is changing, so the more she looks at him, the more uneasy she feels. Hmm, your behavior is weird, says an astute Hye-ri. You sound like you’re talking about a person you like, but you have no reason to like him. And don’t tell me about him dating Seung-mi. You can still like him! It’s nothing like that! It’s just that he doesn’t seem hateful anymore. But more troubling than the inheritance and Hwan is an unexpected meeting at the second branch with a man who turns out to be her father’s friend. From him Eun-sung learns that her father had bought life insurance before his death. Hearing how he had contemplated suicide just so his family could benefit from the money brings tears to her eyes. How he had loved them! Go check on the insurance, her dad’s friend urges. And Eun-sung does. That’s how she learns the huge payout had been collected by a person called Baek Sung-hee. So there you have it: an awesome Episode 18. It made me cry and laugh. The best episode so far. Great recaps again, Thundie. I didn’t pay too much attention what’s was happening during the memorial service so I didn’t even notice Hwan’s hands shaking. I will go back to that scene again. Another couple that makes me giggle like a little girl is the Butler Pyo and Hwan’s mom tandem. Butler Pyo is just like Hwan. He just hide his feelings towards his kitchen apprentice. I look forward the day when the two of them will be in each other’s arm. The clothes hanging incedent was only the beginning. Lee Seung Ki is a very good actor for his age. He’s not that yummy,yummy handsome guy but he is really cute and I like his smile. I heard he was also in Infamous Chill Sisters. I’ll check him out there. Thanks so much for your recaps Thundie – I love them along with your witty inserts! As I continue to watch BL, and although I love Hwan with ES, I am just totally befuddled. I just don’t understand why ES does not like JunSe as a “boyfriend”? She tells JS that she cannot have romantic feelings for anyone until she finds her brother, but then finds herself falling in love with Hwan. I just don’t get it! PLEASE enlighten me with your thoughts on this. I definately see why ES would soften towards Hwan because he is changing, etc. but why would ES never have developed romantic feelings for JS after all he has done helping her, encouraging her, giving her some of the happiest moments of her life after losing her brother, etc. I mean other than Hye Ri, he’s the only other person that ES can be totally honest and candid with – telling him everything about her struggles with her step-witch. I just don’t understand why ES would not even have just a little bit of romantic feeling towards JS. Usually in dramas, it’s because the guy never confesses so he loses his chance, etc. But in this drama JS, seemed to do everything right – he was the first to meet ES, is truly kind hearted, is the first to confess to ES. Why does ES not like him? Why does JS not get the girl? What more can a guy do? WHYYYYYYYYYYY????????? Hmmm….maybe MY true colors are starting to show…..Don’t get me wrong. I love the new Hwannie, but poor JunSe! THANKS SO MUCH AGAIN FOR YOUR RECAPS!! LOVE YOUR BLOG!!! But each to its own I guess… at least I know you know why we love Hwan… OR.. Lee Seung Gi, to be specific..
LMAO… you’re too good Thundie, just too good! you’re amazing, thundie…i am forever indebted to you and your outstanding wit and literary chops. we love you. Cracked up at the scarf comment for Bae Soo Bin. 😀 AGREED – he doesn’t need scarves to look delicious! My hats off to the casting director for choosing this cast. In my opinion, they give justice to their roles. Do they (SBS) have any awards for an ensemble on a TV drama? Note to self: So as not to sound biased, I need to watch City Hall after BL bec. I’m hearing that this was also good. 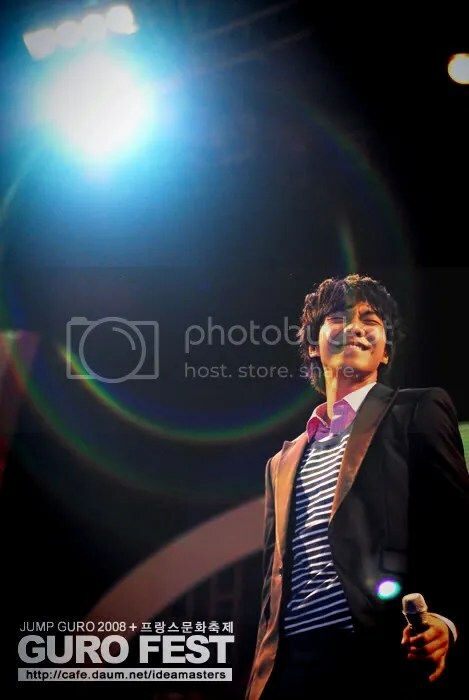 ^^I do miss Seunggi’s normal hair too. His hair is becoming a bit of a mushroom do. Haha, I didn’t like The Hug scene for the flashback. It was just TOO cheesy. I loved the expressions on Hwan’s face when he grabbed Eunsung and semi hugged her tho. 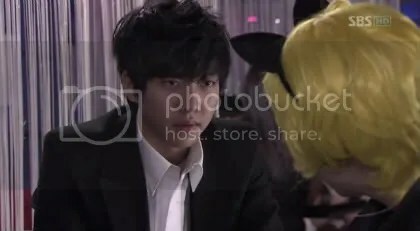 Perhaps not the flailing and the sighing, but Hwan’s eyes the moment he had Eunsung out of a possible truck bulldozing were one of the highlights of Seunggi’s acting so far. I feel sorry for Junseh, but to be honest, I’m not too sorry. However, I really do feel sorry for Seungmi. I don’t know, it’s weird, but my sympathy meter goes higher for Seungmi. Hi Winnie, for some reason I’ve been paying a lot of attention to Hwan’s hands (he has nice hands, btw); that’s how I saw they were trembling during the memorial ceremony. I thought the ceremony was very meaningful and beautifully done. Brief but powerful. Hwan’s crying touched me very much and I took several screencaps of that. But in the end I decided not to include them but to let my words portray his sorrow instead. It just seemed more appropriate. Hi Junkie, I know it doesn’t make sense for Eun-sung not to fall in love with someone like Jun-se. He’s so droolsome and likable, etc. But as a second fiddle, he’s doomed not to win the girl, alas! You know, my love for Jun-se (Bae Soo-bin) was complete from Day One; it can’t get any deeper. Hwan, on the other hand, I had no love for him at all at the beginning; in fact I disliked him heartily. But with every episode I just liked him more. Ep 18 is where I really love him and now I’m 100% rooting for him to win ES. I’m awed by his characterization; kudos to the writer and to LSG for his interpretation of the role. Haha Sugar and Spice, I’m becoming so predictable, eh? The moment I saw Jun-se’s scarf, I thought, OH NO, not that dreaded thing! Actually I don’t mind how Jun-se wears them; he looks so handsome. I just don’t like Hwan’s thick and twisted scarves; it’s like they’re choking him! He looks overdressed when he wears them, too. Already his hair is a distraction and then he adds the fat scarf, aigoo. About the cast, I agree they’re wonderful. I was just thinking today that the supporting roles are so well cast. The manager at the second branch, for example. I just adore him to bits. Then there’s our butler, Hye-ri, Jung and her mom, our awesome grandmom, etc. Hi deeta, show me LSG’s normal hairdo, I want to see! 🙂 About Seung-mi, I stopped feeling sorry for her in ep 19; she’s becoming too much like her mom. But both their characters are so well acted. The witch is especially riveting. Fantastic Kim Mi-sook! Great recap. Thank you much. *muah* This is my favorite episode along with E21 (love that one due to the pace and couple chemistry, not the kiss, haha). Ah, you cried at the anniversary scene. I can’t remember how many caps I took of Hwan’s hands. He has pretty hands. Love the green bench touch at the end. 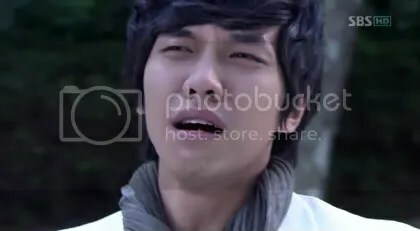 Seung Gi’s actually quite capable at expressing inner rage and playing the victim. Have you seen any of his music videos? He often gets beaten up in them; boy, he can really do crying scenes letmetellya. 😛 I actually find him at his acting best doing the quiet takes, when he is not acting OTT (hehe) or speaking too loud. It’s just me. I favor controlled fury more than all out rage. hehe. The truck scene was hard to pull off. It has been used countless times before. I agree, SGi is still finding his way as an actor. He came a long way from that first episode though, don’t you think? 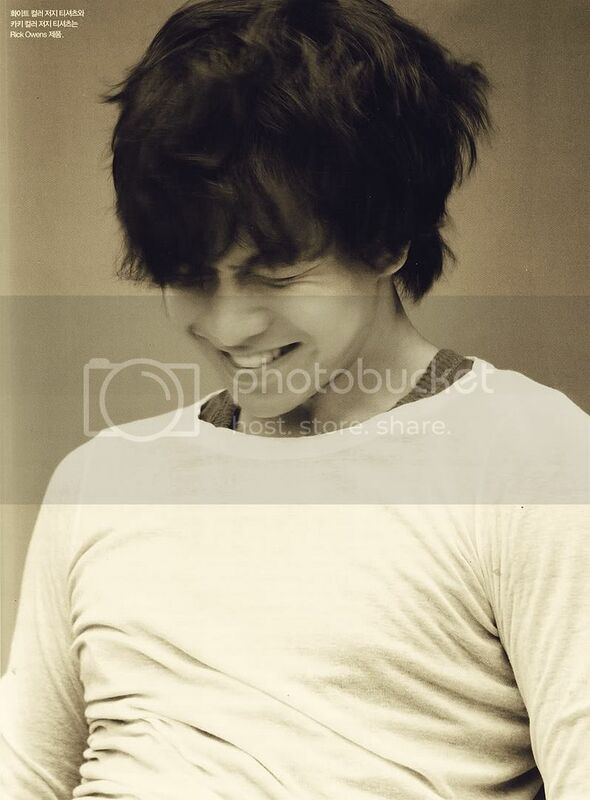 Seung Gi’s boyish charm is his plus. His looks can change drastically based on what he needs to do. It’s the one thing that shows he is a promising actor. 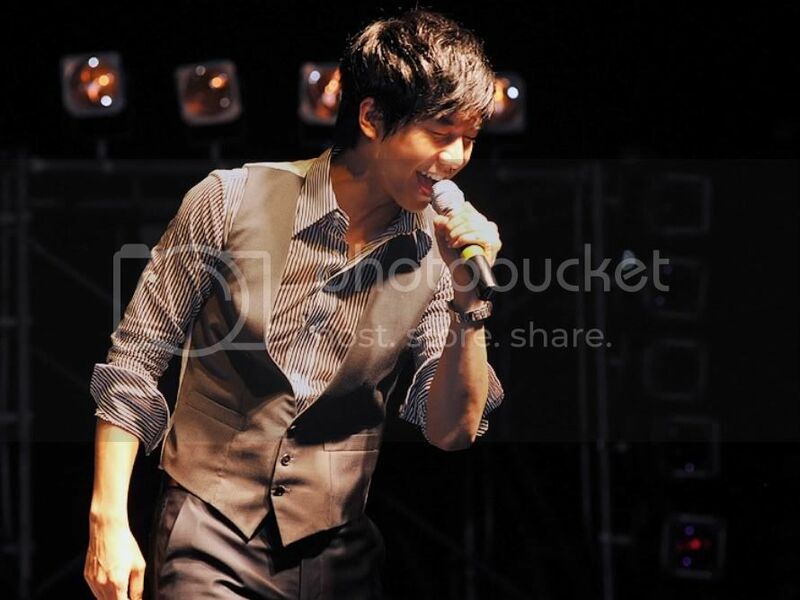 He looks different in 1n2d, in the drama and on stage as a singer. The camera does love his features, especially on close ups. Seung Gi is becoming better looking as he ages. The hair on the other hand has always been drama by itself. He created news when he spiked it short in 2007 with the release of his 3rd album. haha. bad hair, cute guy. And you thought BL was bad hahaha. Many people have asked me on my opinions about the drama. I’ve always told them to watch it for Hwang and Eun Sung, first as separate individuals and then as a couple. I had fun watching and following it. It’s the little drama that could. Hi bee, thank you for all the pics. (Psst, you have an ulterior motive, don’t you? LOL.) Keep them coming! 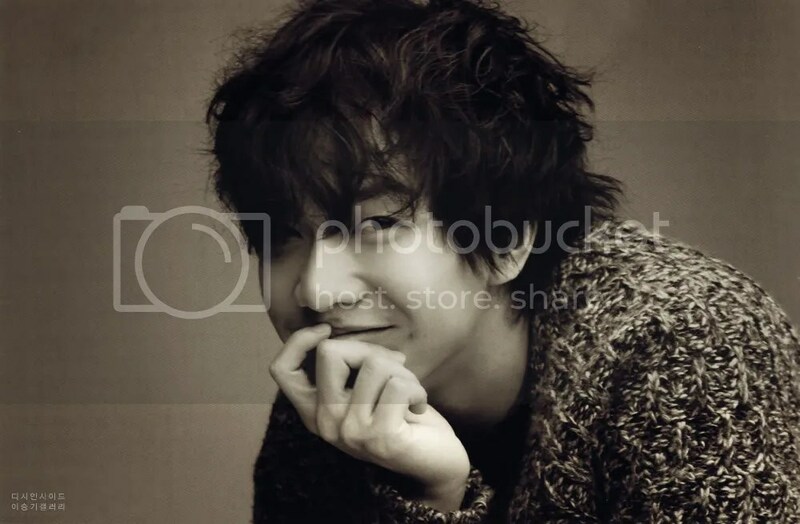 I like the hair in the second one; he and Bi could pass off as twins in that pic. Aww… that’s a perfect description of BL! Love it!! Hi I am silent reader of your blog. And I guess I may be the only one who still roots for Jun-Se and Eun-Sung. Actually I don’t get why Eun-Sung falls for Hwan yet, I know the writer emphasizes it, and everyone just accept it as it is so natural. But I don’t see she is so desparately missing her brother and father these days, and no hatred for BSH and SM that much. I just see while the emphasis of the drama goes for the romance btw the two, ES’s independent self just dramatically fades away. Why does ES remember her agony only when she refuses JS? I don’t feel the way she behaves is so natural. Anyway, albeit my grumpiness of the drama, I am a big fan of your postings. They are all making me giggle whenever I read. Will keep my fingers crossed for your writing. Thus the memorial service scenes holds a really significant feelings for me….Until i watched ep 23!!! THUNDIE-AAAAHHHHHH…..stay away from ep 23!!! Such wretched characters they are and for the rest of the cast…all i could say is that it was really really heart wrenching esp for Junse. Anyhoot…I’ll be waiting patiently for your next recap. Hi tsunamiblues, when you mentioned ep 14, I had to go check my recap. Ah, that’s the one where we begin to see Hwan changing… with hilarious results. I love the new Hwan, too. Hi Suzzie, thank you for your kind words. That’s one explanation I can offer for Eun-sung’s change of heart toward Hwan. She spends a lot more time with Hwan than with Jun-se. She’s seen him at his worst and she’s seeing him in some very private moments at home and at work. He has a painful past which she is aware of; he’s putting a lot of effort into his work; he’s changing in very obvious ways. She actually knows much more about Hwan than about Jun-se. Hi Lolarayz, oh, ep 23 is cry-your-eyes-out sad, eh? Just what my beady eyes need (NOT!) after marathoning Accidental Couple till 4am. This kdrama addiction is not helping my looks at all! I probably won’t touch ep 23 until I have finished my ep 22 recap. About Jun-se’s dad, I want him to marry the witch. They deserve each other. Jumong??? *gulp* wait, how’s his character in there? keke… I ain’t going to ‘destroy’ his “Jun Sae”-image that quickly yet… can..not… lolz. Sigh, it’ll be a dilemma… now I’m intrigued. Jumong… 81 episodes… oohlala~ lol. Looks like im watching BL next! Hey Thundie, you may want to give CH another try. It starts slow but does get better (and less over the top) after episode 5. I was pleasantly surprised since I also did not like any of the PD and writer’s previous works. Plus the first few episodes were funny (a lil OTT too) but lacked depth. But it was saved by good writing (there’s some great dialogue and lines in this show), well-shot scenes, and impeccable acting from the cast. Music was not bad too. Too bad i can’t rave about BL like you guys yet. But I’m excited…..maybe i should catch the last 4 episodes….. sounds like a plan. i know i can’t keep watching this drama because of my activities..
Loving these! Very, very entertaining! Looking forward to up-coming scarf fashion critics!